The New York City Police Department warned citizens that if they were caught riding a dirt bike, ATV, or scooter within city limits, that their all-terrain vehicles would be seized and eventually destroyed. On Tuesday, May 17th, NYPD commissioner Bill Braxton made good on this promise. 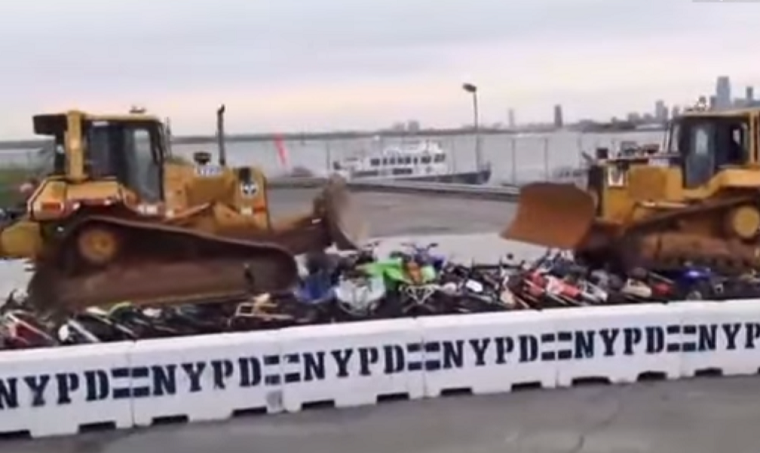 In a video that was streamed live over the New York City government’s Facebook page, Braxton and other police officers can be seen surveying dozens of all-terrain vehicles, which were piled on top of each other at a waterside lot. Then, after Braxton gave a succinct speech, he waved a checkered flag that gave the okay for two large bulldozers to start running over and destroying the street bikes and ATVs. In case you haven’t figured it out already, ATVs and dirt bikes are illegal to own or operate in New York City, as they are viewed as possible threats to public safety. The NYPD publicly destroyed vehicles it confiscated in order to send a message to everyone in the city who rides unlawful all-terrain vehicles. The upcoming summer months are the most popular time for illegal street bike and ATV riding in NYC and the NYPD has already confiscated more than 300 of these vehicles year to date, which is more than double the amount they seized in the same time period just a year ago. Still, there were many Facebook users who disagreed with the city using tax dollars to stage this past Tuesday’s event, arguing those vehicles could have been auctioned away in other states, with that money returning to the city. In NYC’s defense, the city promised all of the crushed metal would be recycled.